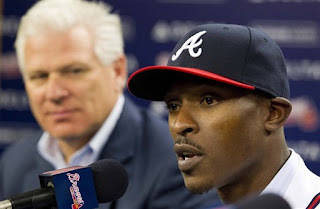 We have seen the first major move of free agency with the Atlanta Braves bringing Rays centerfielder B.J. Upton to town on a five-year, $75.25 million contract. While Upton was one of the top batters on the market, the knock on him has been that he has not met his immense potential in his career thus far. Can he do that in Atlanta? Upton came up to the majors full-time with the expectations that he would develop as a 30-30 guy and while he has not hit 30 homers in a season, he is a strong power and speed threat as he is coming off a career-high 28 homers and since becoming a full-season regular, he has averaged about 36 steals a season. The areas where he has struggled are with average (has only averaged .300 once and since doing so in 2007, he hasn't batted higher than .273), getting on-base (was below .300 last year), striking out (has averaged about 155 a season since becoming a regular) and fielding, where he has been pretty mediocre with the glove over the years and is a clear downgrade from Michael Bourn in that aspect. His bat should represent an upgrade over Bourn, however, and his speed is not that far behind. Bourn did have a stronger WAR (6.0 to 2.8). But can Upton take the next step and be more than just an above-average outfielder? I am not very bullish on that question because you cannot say that Upton has gotten better with every season and his mediocre glove and his inconsistencies in getting on base are flaws. However, he is entering the prime of his career and maybe the change of scenery could be beneficial for him. Personally, I don't think he will be significantly better than he has over his career.